In Re-evaluating Media Ebiquity’s analysis revealed a need to reconsider the media mix. This has raised questions about what proportion of their budget advertisers should consider allocating to radio. Ebiquity have now delved deeper into their proprietary data to help answer this question. Ebiquity’s ROI database is a compilation of all the econometrics work they have conducted over the last 3 years, looking across 150 advertisers, 1900+ campaigns, 10+ sectors and 1000s of models. It builds upon previous ROI overview analyses Ebiquity conducted in 2014 & 2011. 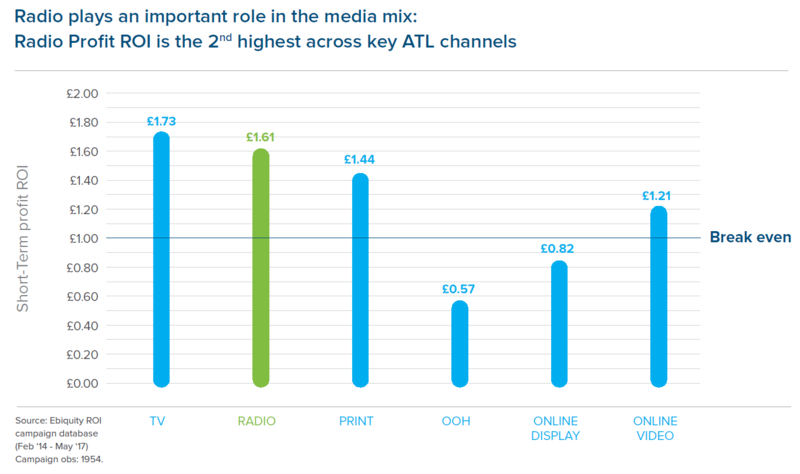 At a headline level Ebiquity’s data shows radio second to TV delivering £1.61 profit ROI. In addition to being the second most profitable media channel for advertisers, radio ROI is improving over time. 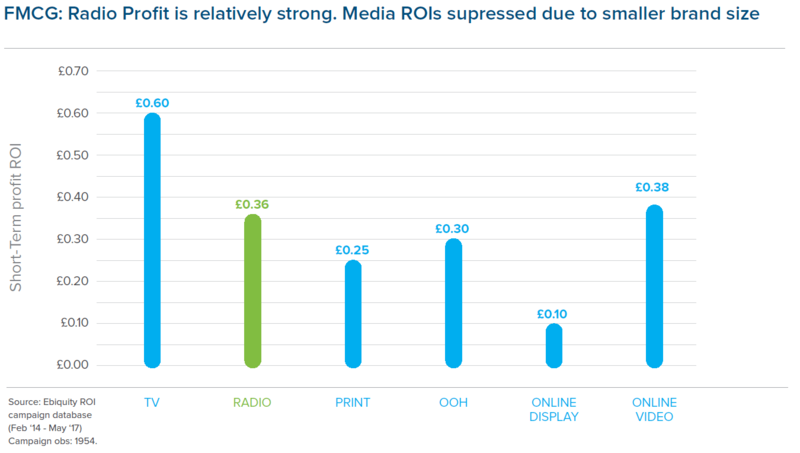 Despite concerns that radio’s effectiveness is in some way being undermined by the growth of digital media, Ebiquity’s analysis shows that the average radio profit ROI has grown by 9% over the last decade. This may be partly down to advertisers using the medium more effectively (see Creative Considerations) but the net result is that advertisers are getting a bigger bang for their buck from radio than they were 10 years ago. Breaking their data down further, Ebiquity have enough cases in their database to enable them to review radio ROI across four different sectors: Retail; Financial Services; Travel; FMCG. In general, radio delivers strong profit across these sectors. This is particularly true of Retail advertisers where radio delivers the highest returns of any medium. The exception is FMCG brands where profit ROI for all media is less than break even. FMCG advertisers tend to use advertising more to build their brand in the longer term rather than focus solely on short term ROI. Radiocentre research also demonstrates how radio plays an important and distinct role alongside TV in enhancing the brand level effects of advertising. Ebiquity reviewed best practice learning in the areas of budget share and creativity, combining these to explore how to optimise overall campaign ROI. 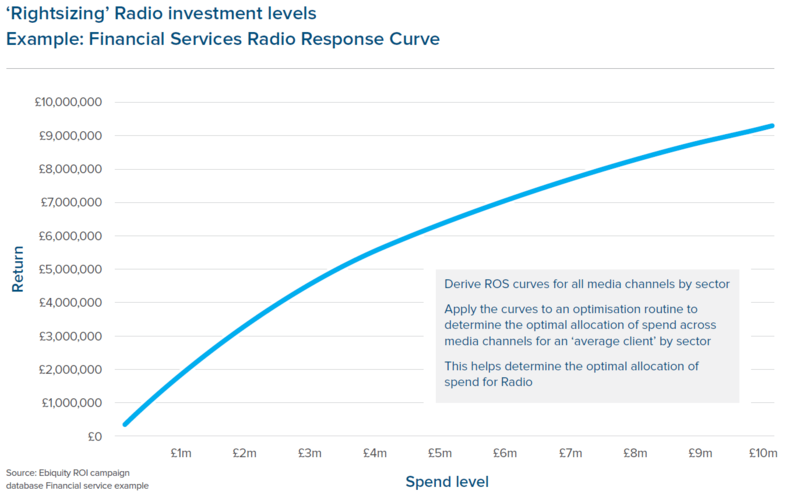 With such positive ROI for most sectors radio would be expected to benefit from a sizeable share of budget. And with the exception of FMCG, the advertisers from Ebiquity’s database appear to spend in line with the average share across the radio sector as a whole. But these shares still feel quite low especially in relation to radio’s share of overall time spent with media (16%) and its relative ROI performance. Could advertisers be getting more from the medium? Ebiquity set out to explore the optimum spend levels on radio advertising. To do this they used sales response curves to determine the marginal benefit of spending more or less in a particular medium by sector.Assessing this by medium by sector allowed Ebiquity to derive an optimised budget allocation by medium for each sector. But it’s also important to remember that these projections are based on averages across a range of campaigns, not all of which use radio to its best ability. Helpfully, Ebiquity’s ROI database also includes some really significant pointers on best practice, in particular demonstrating how radio creativity can contribute to a 400% improvement in profit ROI. This chart shows Profit ROI for different campaigns for the same FMCG advertiser. It’s clear that two have performed distinctly better than the others. The main point of difference between these is that the most successful campaigns used a creative execution which matched closely with the TV campaign, with the best performer matching in terms of both script and audio. Radiocentre effectiveness research has always indicated that creative integration, especially with TV, is synonymous with improved effects in terms of measures such as awareness and consideration but this demonstrates how vital synergy is in delivering significant improvements in campaign ROI. This isn’t rocket science yet it can clearly turbo-charge results. When FMCG advertisers focus their efforts on optimising creative integration, it’s possible for radio to outperform the average TV ROI. 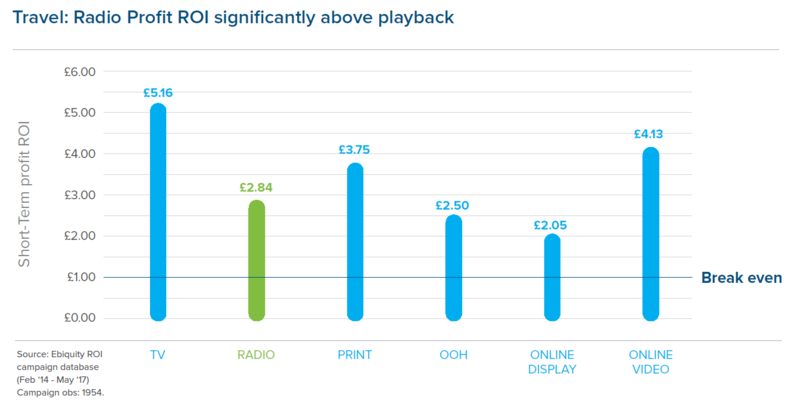 On the basis of these considerations, Ebiquity reconsidered the optimum budget share modelling on the basis that advertisers integrate their radio creative more effectively with their wider media campaign, assuming a relatively modest (when compared to the case study above) 100% increase in creative impact. 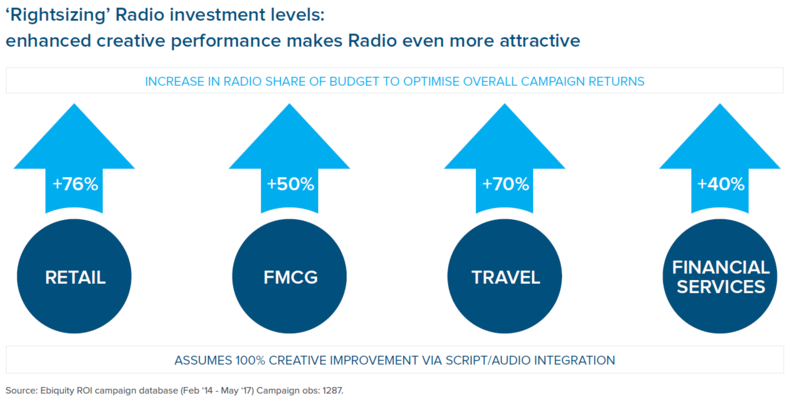 This analysis reveals that radio share of budget should be optimised at even higher levels, with a recommended 40% to 76% increase over the status quo to boost overall campaign returns. Taking into account the difference in spend these represent compared to the status quo this represents a £135m underspend in radio across these four sectors alone. 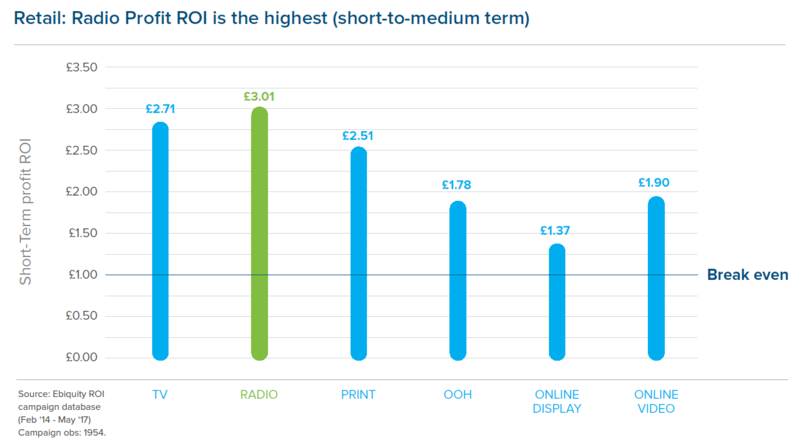 Radio’s profit ROI, second highest amongst media after TV is higher now than it was 10 years ago. Advertisers can achieve significant uplifts in ROI (up to 400%) purely on the back of creative synergy between radio and TV. Campaign optimisation analysis suggests that advertisers are hugely underinvesting in radio and should consider increasing budgets, depending on sector, by a minimum of 40%.